You sinful, sinful people, you. The Kickstarter campaign for The Others continues to rise as more backers join in and you add in such things like the extra Faith teams. As such, there's been some more stretch goals unlocked. They've posted up previews of what's coming up next. That would be the next sin, Envy. Like before, the new Sin is unlocked via a couple stretch goals. The first gets you the Controller mini, the 12 Envy Cards, and the Envy game board. 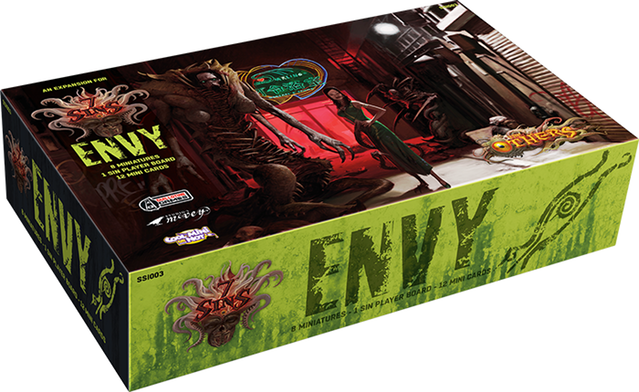 The next unlocks the Envy Abominations. Then you get the Envy Avatar and some Sins dice. Along the way, there's also a dice bag. Less than two weeks to go in the campaign.